This piece, by a former United States Ambassador to the Republic of Korea was previously published in the Winter 2018 edition of Bicycle Friendly America magazine. I was an American diplomat for thirty-six years, living and working on three continents (and a few islands). I’ve been an American cyclist for much longer than that, starting with my daily ride to school as a six-year-old first-grader in El Paso, Texas. Today, as a sixty-four-year-old, I still commute to school every day by bicycle, this time to my office at Stanford University. Over the years, I’ve seen how a love of bicycling transcends culture, age, gender, class and just about every other divide you can think of. I’ve seen the range of ways in which bicycles shape communities throughout the world, and how that continues to change over time. But it was during my time in South Korea that I discovered what a powerful tool for diplomacy a bicycle can be. When I arrived in Seoul in 2008 to be the new American ambassador to the Republic of Korea (South Korea’s official name), I was returning to a country I had known decades earlier, as a Peace Corps volunteer in the 1970s. Although I was the first (and to date still the only) woman to be the American ambassador in Seoul, Koreans were more interested in the fact that not only did my connection to Korea go back to days when bicycles were more common than cars on rural Korea’s mostly unpaved roads, but also that I spoke Korean. And I was eager to get out of the chauffeur-driven, armored car, and to see contemporary Korea in all its changes and challenges. So I brought a couple of bicycles with me to Seoul, and I started riding. Soon I met others, first at the embassy and then in the broader Korean community, who shared my love of riding. Korea is a mountainous country, and there was plenty of mountain biking to do. At the same time, the Korean government was investing heavily in restoring its major watersheds, many recovering from pollution associated with rapid industrialization and urbanization, and along with that, building biking/walking paths to bring Koreans back to the riverside from the tall high-rise apartments where most live now. In the years I lived in Seoul as ambassador, cycling went from being an “old person's activity” to something just about everyone wanted to do. Outside of Seoul, Koreans introduced me to the joys of road cycling on undulating — and sometimes just plain steep — secondary paved roads through a countryside where I could still glimpse the old rhythms of Korean rural life I had known in the ’70s – the seasons of rice and barley planting and harvest, the vegetables and grains spread to dry roadside (don’t ride over them!). I could stop and talk to people as they worked in the fields or rested in the shade; getting off a bicycle instead of out of a car was an immediate help in starting a friendlier, franker conversation. Our cycling groups became more diverse and more adventurous, and we began to organize rides where we could delve into Korea’s recent history as well as its economic and environmental progress and challenges today. In 2010, to mark the 60th anniversary of the start of the Korean War, which devastated the entire peninsula and almost eradicated the Republic of Korea, I spent a week with Korean university students retracing the “Nakdong Perimeter” in southeastern Korea, where South Korea, US and UN forces from many nations defended the Republic of Korea. These students were born decades after the war and knew only prosperous, modern Korea. Many said they did the ride in honor of their grandparents, who had suffered so much in the war. Seven years later, I still hear from these young people, who tell me how that experience — the physical challenge and the insights into the past — helped shape them. In 2011, we rode the length of South Korea, from Seoul to the extreme southwest island of Jindo, now connected by a bridge to the mainland. The issue of a free trade agreement with the U.S. was being debated in Korea; we met farmers, fishermen, factory workers, small and large business representatives, and local officials everywhere to learn more about their worries and hopes. We were joined by Korean and American military members serving at posts throughout Korea in an alliance that continues to provide security in the face of the continuing threat from North Korea. The conversations could be lively (that's diplomatese for sometimes disagreeing), but we enjoyed extraordinary hospitality and food everywhere. One thing to make clear, if it is not already: I am not an elite rider, and never have been. I ride a bicycle like I speak Korean, just good enough, but the rewards are great and many. Cycling breaks down barriers. It builds bonds with those who cycle together, and brings us out of our isolated and self-selected bubbles. You can't do good diplomacy without that. Even after I completed my three years as American ambassador in Korea, I wasn’t done cycling in Korea. Earlier this year the American embassy organized a ride across South Korea to highlight the upcoming 2018 Pyeongchang Winter Olympics. I joined my former colleagues for the final three days of the ride, and found the Korean mountain passes, especially approaching Pyeongchang, as beautiful — and challenging — as ever. Once we’d visited the site of the Olympic ski jump, it was a thrill to fly downhill to the East Sea: How special that the Winter Olympics site for 2018 also features beautiful oceanscapes nearby. I’m sure there will be some hardy Korean cyclists out for the Winter Olympics; the passion Koreans bring to cycling only grows, and is infectious. 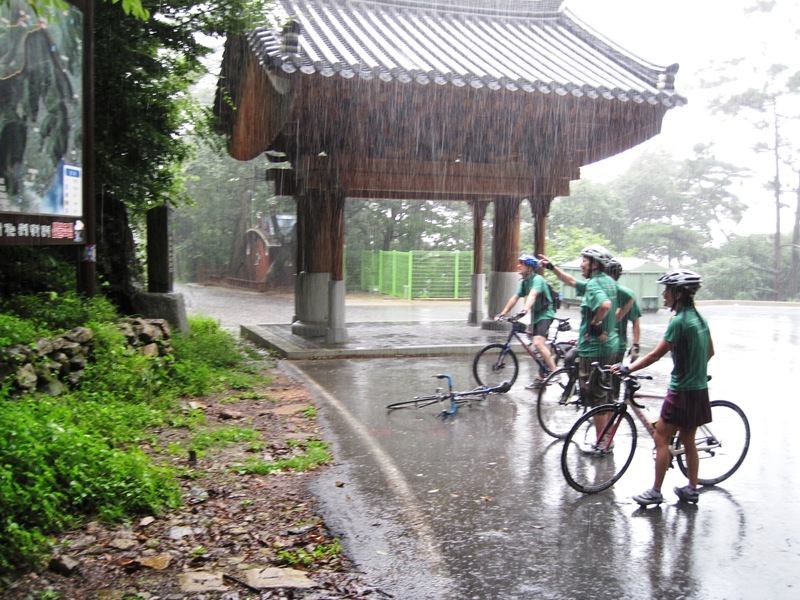 But for those (including me) who are more fair-weather cyclists, Korea offers a whole range of cycling opportunities. My advice: Go to Korea for the cycling. Stay for the people, the food and the hospitality. If you want to read more about cycling in Korea, my blog (http://goo.gl/3bv6I) includes many entries that describe cycling trips. Kathleen Stephens, a career diplomat, was US Ambassador to the Republic of Korea from 2008–2011. She is now a fellow at Stanford University. All photos courtesy U.S. Embassy Public Affairs, Seoul.